Wikimedia Commons, treatment by CJR. Journalism is publishing, not not publishing. And by the codes and self-understanding of distinguished professionals like Baquet or Bill Keller, one of his recent predecessors as executive editor of The New York Times, journalism is certainly not the same as doing politics. Except when the politics concerns supporting efforts to make it easier for journalists to secure information that the government would rather not release. Reporters and editors worked hand in glove with Rep. John E. Moss, a Democrat from California, from the time he began chairing a subcommittee on government information in the House of Representatives in 1955 until he succeeded in getting what became the Freedom of Information Act through Congress and signed into law by President Lyndon Johnson in 1966. In those 11 years, reporters fed the Moss committee instances of information requested and summarily denied by various government agencies. Some journalists eagerly agreed to testify before his committee. Reporters, in short, were not on the sidelines. They were visibly on the field. But how did it happen at all? In 1948, the American Society of Newspaper Editors set up its first-ever committee on government restrictions on the freedom to gather and publish news. It was called the “Committee on World Freedom of Information”—a name that implied that limiting journalists’ access or straightforward censorship was a problem in other countries. The committee protested Argentina’s restrictions on what US correspondents could report, censorship in Guatemala, and—closer to home—US military censorship in occupied Japan. When the ASNE committee turned to the problem of secrecy in the US government in the early 1950s, it chose to actively criticize such secrecy, but not to “become a legislative committee.” Even in 1953, when ASNE leaders realized that significant progress on government secrecy might require federal legislation, they concluded that “watching all such legislation” would be an important task for the committee, but did not suggest taking a public position. Representative Moss changed this. Moss was a small businessman who had served several terms in the California legislature before his election to Congress in 1952. During his first term, he requested some data from the Civil Service Commission about dismissals of government employees on suspicion of disloyalty. The commission flatly turned him down. “My experience in Washington quickly proved that you had a hell of a time getting any information,” Moss recalled. Two years later, a newly re-elected Moss became chair of a House subcommittee on government information. Sixty years ago November 7, he held his first hearing on government secrecy. Again and again, when members of the Moss subcommittee struggled to make government less secret, they turned to their friends in the press. And the journalists were most obliging. They testified. They invited Rep. Moss to speak at their conferences and conventions. They covered his hearings. They awarded him prizes. And they wrote editorials. In return, Moss Committee staffers wrote the annual reports for some of the press associations’ own freedom of information committees. An often-disgruntled Moss committee member, Michigan Republican Clare Hoffman, complained that Moss committee reports turned up in the newspapers even before the reports were completed. Not all journalists offered support. Some were not much interested in the activities of the Moss committee. Others were interested but declined to testify. “What newsman in this town is going to admit that he cannot dig for news and develop his own sources?” asked Moss’s chief of staff Sam Archibald, himself a former Sacramento Bee reporter. In spring 1965, with a vote approaching on the bill that would come to be known as the Freedom of Information Act, key Moss staffers met with Theodore Serrill, head of the National Editorial Association, the leading association of the country’s weekly and small daily newspapers, to prepare the association’s upcoming testimony at Moss committee hearings. Serrill explained at the outset, “I will say whatever you write.” Serrill noted that the NEA leadership would soon get in touch with its members and urge them to contact their members of Congress. “What do you want us to say?” he asked—and the Moss staff members told him. Similar communications passed between chief of staff Archibald and the Associate Press Managing Editors (APME), with Archibald advising APME leaders on what to say and how to say it. What Moss and his allies wanted most was to open up the burgeoning executive branch of government to public—and specifically Congressional—scrutiny. Their intention was not to open up all the actions of government to the press. FOIA covers the executive branch of government, not the courts or Congress. In subsequent years, a more broad-based demand for disclosure would lead to laws like the Legislative Reorganization Act of 1970, which made a much larger share of Congressional committee meetings open to the press and the public. It also, quite importantly, effectively ended the common House practice of voting on amendments before the whole House by so-called “unrecorded teller voting,” whereby vote totals were publicly announced, but which legislators voted aye and nay was veiled in secrecy. Congress was likewise increasingly interested in corporate disclosures, especially with regard to consumer affairs. The first ever White House adviser on consumer affairs, Esther Peterson, a veteran union organizer and the chief of John F. Kennedy’s Women’s Bureau in the Department of Labor, was appointed to the post by President Lyndon B. Johnson in 1964. Legislative proposals for truth-in-packaging-and-labeling and truth-in-lending made their way into law in 1966 and 1968, respectively. The government required health warnings on cigarette packages in 1965. What these initiatives had in common with FOIA, curiously enough, was not so much a belief that democracy requires transparency as a fervent desire to show that the free and democratic political institutions and free market economy in the US lived up to its reputation as a contrast to the enemy’s system—the closed society of the Soviet Union. 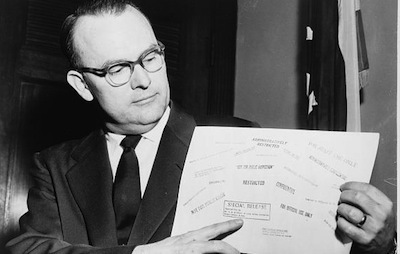 Moss liked to praise the press for “fighting hard to punch a few more holes in the paper curtain surrounding Washington bureaucracy.” He accused the Pentagon of “Soviet-style control of the news—giving out the good news and hiding the failures.” He told the APME in 1957 that information on the use of nuclear energy for domestic purposes was easily available in open Russian publications on technology, but that nearly all comparable American information remained classified. Anti-secrecy and consumer information reformers were appealing to an audience far more likely to have attended college than ever before. They were also appealing to Americans who, in college, were far more likely to have found themselves in classrooms that had abandoned the handing down of a received tradition and an accepted canon for a pedagogy that stressed the encouragement of critical thinking. The idea of transparency in government as we know it today did not wait for the internet to become part of American political culture. But nor did the founding fathers develop it. The First Amendment, although enshrining free speech and press by forbidding the federal government to make laws abridging them, said nothing about government release of information to the public. Very little before FOIA institutionalized disclosure practices. Would we have inaugurated these practices without direct “political” intervention on the part of the news media? That counterfactual is not something anyone can answer with certainty. All we can say with assurance is that FOIA, in fact, came into existence with considerable active and self-conscious assistance from the press. Communication scholar Jim Carey wrote, in one of his last publications, that journalists are obliged to abandon their objectivity in exactly this domain—they “can be independent or objective about everything but democracy,” he advised. “About democratic institutions, about the way of life of democracy, journalists are not permitted to be indifferent, nonpartisan, or objective. It is their one compulsory passion, for it forms the ground condition of their practice.” American journalists and journalism organizations had come to the same conclusion in practice, if not in theory, more than 50 years before Carey wrote those words. Is this inconsistent with journalists’ professions of political detachment? I think so. Let’s face it: the practice of journalism is not as neatly ruled as the theory. Nor should it be. As we recapture some of journalism’s history, we should be rethinking the theory of its role in democracy. Michael Schudson is a sociologist and historian of the news media and a professor at the Columbia Journalism School. His latest book, The Rise of the Right to Know: Politics and the Culture of Transparency, 1945-1975, was published last month by Harvard University Press.